Abdul Chaum Ansari is a mild-mannered and friendly man with a face marked by history. The spokesman and director of the museum of the important Blue Mosque in Mazar-e-Sharif in northern Afghanistan confirmed the message of peace in Islam: "Islam is Peace. After the fight, the Prophet Mohammad had good relations with other religions. To kill civilians who want to help is generally wrong." The member of the Shura Council of the Blue Mosque and the leading Iman family of Afghanistan is arguing that only extremist politics spoil Islam and turn it towards aggressive convictions. He is convinced that only criminals lead innocent simple people on April 1st 2011, when the UN Office in Mazar-e-Sharif was stormed by members of a demonstration of 3,000 Muslims, a female pilot from Norway working with the UN and two other UN workers were killed, together with four former Gurkhas working as private security guards and many others in different parts of the country in subsequent days. This had been the second demonstration in the fourth largest city of Afghanistan, against self-appointed US "pastor" Terry Jones' burning of the Holy Koran in Florida. He thereby initiated the violence and so is responsible for the killings as well. Ansari explains that the first demonstration had been peaceful while the second grew out of control unexpectedly. They were infiltrated by armed radicals, most probably pilgrims from other places in the area as part of the Naurus Holiday. As with dry wood, a small fire erupted and drove the angry masses towards hatred, aggression and ultimately killing. First, an American flag was burned outside the mosque as a sign of protest after the sermon by Jones. The police had expected no violence, were under-represented and expected the demonstration to progress from the mosque to the west and not the south .Thus, the security forces were not able to protect the UN office there against a large crowd of so many people. 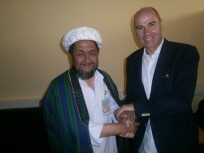 World Security Network President Dr. Hubertus Hoffmann shook hands with Abdul Chaum Ansari, Shura Council Member, spokesman and director of the museum of the important Blue Mosque in Mazar-e-Sharif , and a member of the leading Iman family of Afghanistan, promoting mutual codes of tolerance and respect (see www.codesoftolerance.com). "We call them guilty criminals. The people misused the preaching in the mosque for their political purposes", Ansari stated. After the killing, dominant governor Atta Mohammed Noor ordered that there should be no demonstrations from the mosque again. The German ISAF Regional Commander, Major General Markus Kneip, met all religious leaders of Mazar-e-Sharif and asked for a halt to the violence and reiterated the respect of Westerners for Islam and the Holy Koran. In the two years since then, no more major incidents have been reported. Ansari explained that contrary to Pakistan – where on average more than 300 Shiites are killed by Sunni extremists each year – in the north of Afghanistan, Shiite and Sunni mullahs are working together and the groups live peacefully side by side. "Afghanistan has good religious leaders who promote tolerance between Sunnis and Shiites, contrary to the aggressive preaching from Shiite Mullahs in Iran versus Sunnis, as well in Mazar." The Blue Mosque is a holy place for both groups still since hundreds of years. The Shrine of Ali, stepson of the Prophet and admired by both Islamic groups, has been there for more than 1,300 years. The impressive mosque, with beautiful art and different blue stones, is 548 years old. For centuries, beautiful white peace-doves have lived there and made the mosque a symbol of perpetual peace. Ansati hints that the radicalization in Afghanistan came from outside and the influence of the Pakistan-based Wahabism, along with a lot of money from Saudi Arabia. It became the source of the radical spirit of the Taliban. After 30 years of permanent war, most young people now want to pray and learn the real, pure message of the Prophet in the Blue Mosque. In Surah 5.48 in the Holy Koran, God is stated to be committed to diversity in the thinking and actions of people: "For each of you we have set a direction and path. And if Allah had willed it, he could have made you one community. But He wants to test you in what He hath created. So rush to the good things in the wager. To God will you all return, and He will inform you of which you differed." This Surah emphasizes God-given differences in faith and the peaceful struggle for the truth as the people are given prophets. The final account of a God-pleasing life is himself and is not left to the people. Only "then" and only through Him can this be directed. An Islamic enlightenment renaissance is urgently needed; one that brings the ancient and true doctrines of Muhammad for grace, respect and dignity back to life and curbs the power of the disgraced and contains the killing and violence. Back to the roots of the merciful God. Exemption from the misanthropic and self-destructive hatred. Even the schism of the Sunnis and Shiites requires this healing through the true Islam of God's mercy. A true Muslim denies the negative forces of Jahiliyyah and advocates the Prophet of a world of din and a society of hilm. Ansari is on this path in the Blue Mosque – a good step forward. The World Security Network is active in this important reconciliation process with its main project: www.codesoftolerance.com promoting Codes of Tolerance for other religions and ethnic minorities.